So I've been running the python client's websockts with 100 around stock ids. I am printing the ticks in logger and saving it in mysql batching it so it runs 1 insert every second. I found that the high is mismatching with a lot of stocks along with open with the graph candles in kite. I am not getting the data in my log file or mysql ticks. Now my question is, Is it because of my code taking too long to miss the next tick (which is unlikely since as I've noticed I was getting a connection closed uncleanly when I was running a lot of operations.) I am running it now with 10 commodities to provide better understanding of the issue I'm facing will post updates. I personally do not think it's the kite api not working, although I would appreciate any help regarding how I should write code so that I don't miss data of 100+ stocks. Are you using multithreading? You need to make sure you haven't blocked the main thread. async await can be used instead of threads? Also I timed my entire on_ticks function. The output screenshot is pasted above. It's taking only 8-10 ms time for the method. Here's the code. I don't know if writing from scratch is going to help. I was only running 6 commodities still missed data in 2 laptop same code at the same time which I don't think should be our code's fault. Also my laptop's a macbook pro 15". It is not a coding fault. 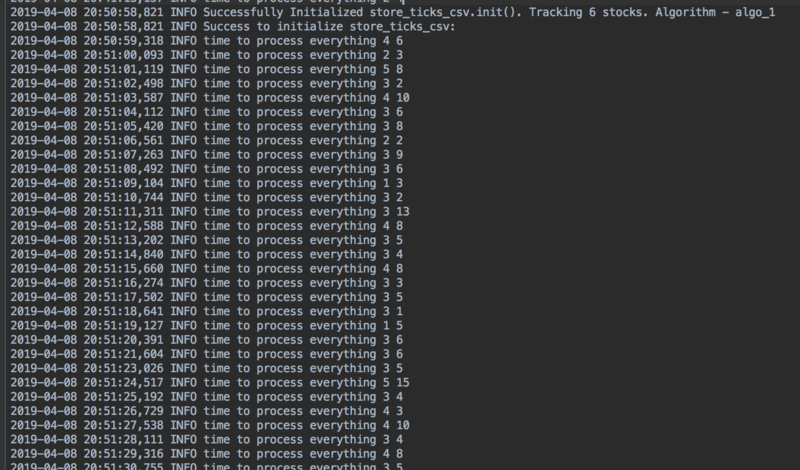 When the thread is busy doing computation or storing to the database then it is quite possible that you may miss few ticks. And also take a look at this thread to know why charts of two platforms don't match. The values will never match but it will be near.